Gambian born Music sensation, Emmanuel Mendy has added another cap to his already outstanding music career. Mendy an acclaimed Music teacher and soloist in the Lone Star State of Texas has been hailed by his compatriots for using his musical talents to unify the Senegambian community in the United States of America. A Choir member quipped that this initiative is by far the best thing to happen amongst Senegambians in the Diaspora for according to him, ‘ The two most important things that binds us as one people is God and our culture.” Therefore for Emman to conceptualize this initiative is beyond commendable,” he concluded. Emmanuel Mendy is a choral director, vocal performer, music educator and composer. He was born in The Gambia in West Africa, where he discovered his passion for music. Emmanuel joined his local church senior choir at the tender age of 13 where he sang tenor and was the percussionist playing the local drums, a role he would hold for 11 years. Emmanuel also attended St. Augustine’s High School in The Gambia, where he played guitar in the school music band.Emmanuel had an opportunity to travel to the USA to pursue his educational aspirations, which landed him in Texas, where he auditioned and gained admission to Navarro College in Corsicana. While at Navarro College, Emmanuel performed and sang solos in all the three choirs of the school; Choral ensemble, Chamber singers and Show choir. He also performed major roles in Navarro college musicals including Oklahoma, Mame and Greece. During each of his 2 years of music studies at Navarro, Emmanuel was also selected to represent the college at the Texas Music Education Association (TMEA) All-state choir. After graduating with the Associates in Arts (AA) in Music (voice) degree, Emmanuel went on to pursue the Bachelor of Music (BM) degree at one of the top music schools in the USA, The University Of North Texas, where he earned a BM in General Choral and Instrumental music, with proficiencies in vocal performance and choral studies. While at UNT, Emmanuel studied voice under renowned American tenor Richard Croft, Dr. Jonathan Yarrington and Dr. Caitlin Mohr. He studied choral conducting with Dr. Allan McClung and sang in the Concert Choir under Dr. Allan McClung and Dr. Dwight Jilek. 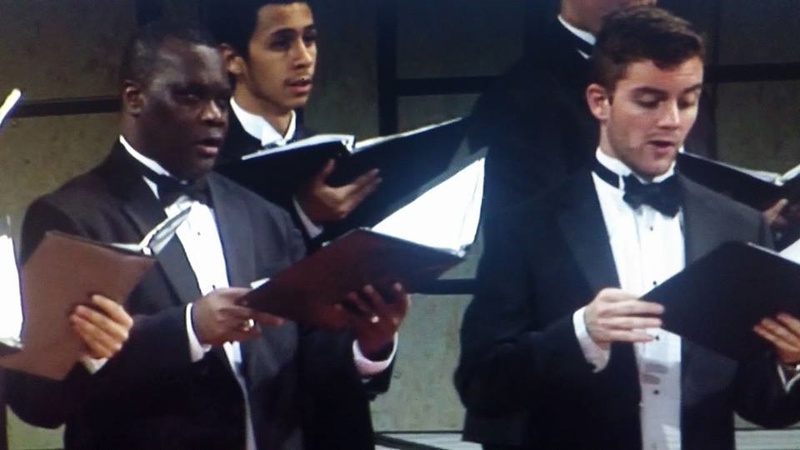 Emmanuel sang with the UNT Canticum Novum choir under Dr. Henry Gibbons and in the Grand Chorus under renowned choral director Dr. Jerry McCoy. Emmanuel also sang in few opera productions at UNT. Emmanuel currently teaches voice at his residence in Texas and is regularly sought to perform at weddings, church concerts and other engagements. Because of his extensive vocal range, Emmanuel also sang tenor and baritone with St. Patrick Catholic church choir including a recording of the Mozart Requem, where he was the tenor soloist. Emanuel works with African singing groups and choirs such as the Gambia Christian Association (GCA) in Dallas Texas and the Gambia Christian Organization in Atlanta Georgia and volunteers as a high school and middle school teacher in Texas. He has conducted several choral workshops in The Gambia and has written several choral compositions in English and in some of the native languages from Senegambia. In January 2017, Emmanuel was invited to perform a clinic and lecture on African music history and African choral music performance practice at UNT College of music. Emmanuel is very interested in discovering the best ways that proven vocal and cultural pedagogy and technique can be applied to traditional African music and other cultural music while preserving the unique quality, authenticity, style and cultural aesthetics of various types of music.